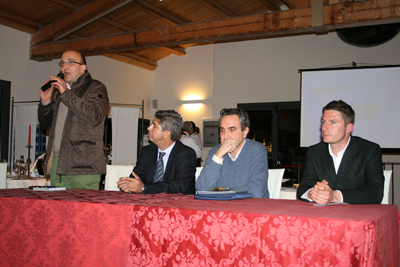 The initiative "Abruzzo meets Brazil", organised by Slow Food and WWF Abruzzo with the Brazilian Association of Organic Cattle Ranching (APBO) and Istituto G. Caporale, was launched on 24 March 2011 at Borgo Spoltino restaurant, Mosciano. A presentation by APBO was followed by a dinner devoted to organic meat from the Pantenal wetlands. Pantenal, in the state of Mato Grosso del Sud, is the world's largest continental wetland system and one of the most important natural environments in Brazil, thanks to its livestock and unique biodiversity. This is the setting for the work of APBO, established in 2001 by cattle ranchers whose production is based on the utmost respect for the delicate environmental balance. Over the years the Association has reached out to numerous environmental organisations, including WWF, which have recognised that its way of farming is a productive alternative that helps environmental conservation in the area. This programme for the sensitive and sustainable exploitation of the extraordinary agricultural and cultural riches of Pantenal is part of a long-standing collaboration between Istituto G. Caporale di Teramo and the government of Mato Grosso del Sud. The Institute provided Mato Grosso del Sud with the technical assistance needed to zone areas in relation to the health of animals susceptible to foot and mouth disease (cattle, sheep, goats, etc. ).This contribution was fundamental for the area to be recognised as free of foot and mouth disease, through vaccination, by the World Organisation for Animal Health (OIE). The Institute has also provided technical assistance, materials and software for an electronic cattle ID and registration system in line with European Union regulations. Thus, with the support of Slow Food, came about the idea of promoting the organic meat of this region through the masterful art of Abruzzo cuisine.